In October 2010, the U.S. Food and Drug Administration warned Evenbetternow, LLC, of Tucson, Arizona that several of its over-the-counter (OTC) chelation products were unapproved drugs, that its Heavy Metal Screen Test was an unapproved medical device, and that neither could be legally marketed . The letter also challenged claims that the test (a) "is a wonderful way to know if you have heavy metals in your body," (b) can "show you the progress along the way as you use the Bio-Chelat and EBN Detox clay baths," and (c) "is most useful in determining if your body's detoxification pathways are compromised or not." Evenbetternow's "Heavy Metal Detox Main Page" suggests that "toxic metals and chemicals are directly linked" to attention deficit disorder, Alzheimer's disease, asthma, arthritis, autism spectrum disorders, auto-immune disorders, candidiasis, chronic fatigue syndrome, epilepsy, fibromyalgia, gulf war syndrome, hypertension, insomnia, infertility, kidney disease, liver disease, Lou Gehrig's disease (ALS), multiple sclerosis, Parkinson's disease, schizophrenia, and thyroid disorders . Another page on the site titled "Signs and Symptoms of Heavy Metal Toxicity and Chemical Toxicity" lists these: alcohol intolerance; allergies (environmental and food sensitivities); anxious and irritable; brain fog; cannot lose weight; chronic unexplained pain; coated tongue; cold hands and feet; dark circles under the eyes; depression; digestive problems; extreme fatigue, frequent colds and flus; headaches; high levels of toxic metals in your blood, urine or tissues; insomnia; intolerance to medications & vitamins; loss of memory and forgetfulness; low body temperature; metallic taste in mouth; muscle and joint pain; muscle tics or twitches; muscle tremors; night sweats, parasites; prone to mood swings; prone to rashes; sensitive teeth; sensitive to smells like tobacco smoke, perfumes, paint fumes and chemical odors; skin problems; small black spots on your gums; sore or receding gums; tingling in the extremities; unsteady gait; and vitamin and mineral deficiencies . Since heavy metals contribute to up to 80% of the causes of all diseases, the assessment for heavy metal contamination has become an essential component of any initial diagnosis. The dithizone reagent offers an alternative way to assess heavy metal toxicity and is actually the only test which allows the assessment on the intracellular level . The idea that heavy metal toxicity is responsible for so many conditions is preposterous. The test kit includes a test tube that contains a solution of dithizone, a test paper that checks the solution, a pipette for placing your urine into the test tube, and a color chart said to determine the levels of heavy metals in your urine. 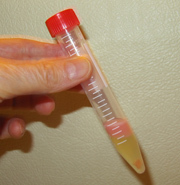 After the solution is checked with the test paper, urine is added to the test tube, which is shaken and allowed to stand for two minutes. The color band or ring that forms at the top of the solution is then compared to the color chart. Dithizone (diphenylthiocarbazone) is a green colored sulfur-containing organic compound that forms yellow, red, or violet complexes with more than dozen metals . It is very insoluble in water and so is usually prepared in chloroform or another organic solvent. The complexes it forms are also insoluble in water and concentrate in the organic layer, which floats to the top. Simple (eyeball) colorimetric tests are done by shaking the aqueous (water-based) sample with the dithizone and comparing it to a color chart. When I put my urine into the test tube and shook it, the color immediately turned pink and, about a minute later, a pink layer formed at the top. The color chart considers this "high concentration." Since I have no significant exposure to heavy metals and no symptoms of metal toxicity, I do not believe my test result was accurate. Dithizone forms reddish complexes not only with potentially toxic heavy metals (lead, mercury, cadmium, and arsenic), but also with zinc, nickel, tin, cobalt, bismuth, silver, and ferrous iron. Copper forms a yellow or violet solution, depending on the pH of the solution. Thus the test cannot distinguish between metals that might be problematic and those that are not. There is no way to prevent interference from "non-heavy" metals with a match-the-color-chart assay because urine acidity (pH) varies with diet and can influence the results. For example, at the optimal pH for detecting lead, dithizone is unreactive to mercury and very sensitive to tin and bismuth. At the optimal pH for mercury, silver and copper are also detected. At the pH best for detecting cadmium, cobalt and nickel interfere . The concentration of individual metals in the urine is also influenced by the concentration of the urine itself. Thus the results can vary with the amount a fluid the person drinks and how well the person's kidneys function. Abnormal kidney function can result in the urine being either too concentrated or too dilute. For this reason, most valid tests for heavy metals include assessment of kidney function, usually by determining the amount of creatinine in the urine. Tests should be able to distinguish between those who have a condition and those who do not. It is not proper to offer a test in which a positive result is cause for concern but a negative means that the person should have further testing. NissenMedica's advice to "detoxify" in all cases with a "positive" test is preposterous. A diagnosis of lead, mercury, or other toxicity should not be made without a confirmatory laboratory test plus severe toxicity symptoms. In most cases where a person has a level that is undesirably high (but not toxic), avoiding the source is sufficient to solve the problem because without further intake, the body will excrete the unwanted substances. But for those who are naive or foolish enough to treat themselves based on the urine test result, Evenbetternow offered several oral chelation products. I followed the directions explicitly and it turned out to show a heavy concentration of metals present in my urine. Then I went to the doctor and they reluctantly performed the tests over and they all came back negative. Not only did I waste the money buying this test, but it prompted me to do thousands of dollars of other tests that all came back negative. What a waste of money. It would have been interesting to administer the test to a large group of apparently healthy adults and see whether any of them tested "negative." However, the cost of the test kits was too high to make this practical. In addition, the test kit instructions imply that there cannot be a truly negative test because if the dithizone solution does not change color, they advise consulting a professional (or retail merchant) for further investigation! The Heavy Metal Screen Test is not a legitimate diagnostic test. It appears to me to be a marketing tool—one of several types of scare tactics used to persuade people that their body contains toxic or potentially toxic levels of lead, mercury, or other metallic ions. It is not reliable for diagnosis and lacks FDA approval, which makes it illegal to market within the United States. The FDA should be congratulated for ordering Evenbetternow to stop marketing this test and the chelation products it is used to promote. Robert S. Baratz, M.D., D.D.S., Ph.D. served as a consultant for this article. Cruse AE. Warning letter to Donald Nichols and Andrea Nichols, Oct 12, 2010. Heavy metal poisoning safe chelation and detoxification. Evenbetternow Web site, accessed Oct 23, 2010. Signs and symptoms of heavy metal poisoning and chemical toxicity. Evenbetternow Web site, accessed Oct 23, 2010. Total CARE Heavy Metal Screen Test. NissenMedica Web site, accessed, Oct 15, 2010. White WE. Dithizone as an analytical reagent. Journal of Chemical Education 13:369-373, 1936. Wichmann HJ. Isolation and determination of traces of metals: the dithizone system. Industrial and Engineering Chemistry 11:66-72, 1939. This article was posted on November 23, 2010.